As noted in my recap from the recent Navy Air Force Half Marathon here in D.C., while I may not have hit my goal time I did learn some valuable lessons to take with me in the final month of prep for Marine Corps Marathon. Yikes, one month – this was the first thing I saw on my Facebook newsfeed this morning causing simultaneous excitement and full-on panic! My main takeaway and the first thing I blurted out when I saw Ian at the finish line was, “I need my water pack for longer races!” I wear a Nathan Hydration Vest when I train and have also worn it during my last three marathons. They are the only three of the nine I’ve run under four hours and have been under four by a big chunk of time. Granted, I was better trained for those races also, but I do think the vest makes a big difference. Unlike some of my older camelbacks, this vest is so light my neck and shoulders aren’t a bit sore even after running 26.2 with it on. Well, at least not any more sore than running 26.2 normally causes. It doesn’t bounce or move around at all and feels as if it’s barely there. I’ve learned to do the whole pinch the water cup thing and drink on the run, but I don’t like doing it and I don’t like depending on water stops. I’m much better at getting water down in frequent small sips then gulping down a cup every few miles at an aid station. There were a lot of points along the half where I wished I could just have a sip of water meaning that each time I got to an aid station I gulped down too much water knowing I wouldn’t have another chance for a couple miles leaving that uncomfortable sloshing feeling in my stomach. I also didn’t memorize where the aid stations were so it ended up being 10 or 15 minutes after taking my Honey Stinger bites before I had any water. The pack also has an easy access pocket on the front strap to hold all of my gummies. I know a lot of people think the added weight slows you down in races, but it just works for me and has proven so in the past, so I’d like to stick with it. That said, a week after reaching this conclusion I saw talk on Twitter about MCM banning camelbacks this year. It appears to be a new security measure because of the Boston bombings. It’s buried on their website, so I’m not sure how serious they are about this. I have a tough time seeing how this could be a real security threat, but I also don’t want to cause any issues, so now I’m at a loss for what to do. I debated before the half whether or not to wear a watch or just go by feel. 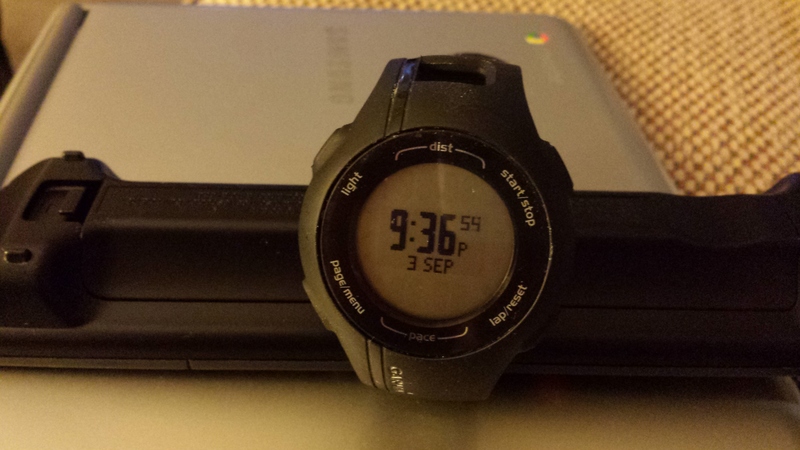 I was all set to go without, but let my coach convince me to just wear a regular stopwatch. He’s not a fan of Garmins, which I understand, but for me I feel that I would have been better keeping the Garmin on or going completely without. The in-between just meant I was doing more math in my head along the course to determine my pace and kept me from just running on effort. Since I plan to run with a pace group at MCM, I’m not too worried about having to look at my watch much anyways, but will go with the Garmin so I can have a record of the race. I don’t think I had enough fuel in me for the half. Part of it was that I forgot the Honey Stinger waffle I packed to eat once we got into D.C., but I’m also getting up much earlier for races than I used to. I used to cut it pretty close so a bigger breakfast wasn’t always smart or just wasn’t necessary because I wasn’t going to have 2 hours to get hungry during. More calories on marathon morning will definitely be important, especially since I’ll be going twice the distance. Bonking in a goal race because I didn’t eat enough beforehand seems silly! I figure if I say this enough times I’ll follow through with it. This year’s Cherry Blossom race was one of the first times that I was able to actually follow through on this plan and boy did it feel good to fly through those last few miles. The beginning of a marathon should feel easy, so I’m going to do my best to stick with the pace group rather than jump out too fast leaving me exhausted later in the race. Have you learned any big lessons on race day that you used to get better in your next big race?? 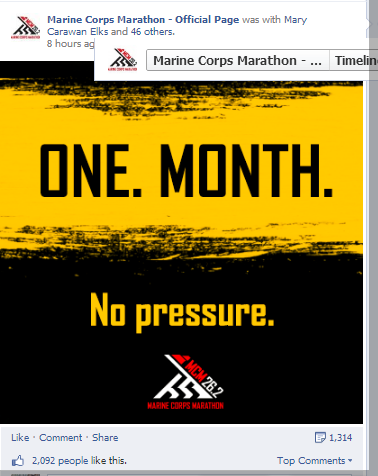 I can’t believe the Marine Corps Marathon is going to be here in less than 100 days. 98 to be exact! I’m still following the run plan from my coach, so not too much has changed since I was already working to build toward marathon training, but now I start to really pay attention to how things are going and stress about how it’s going to impact my race. I’ve been running a bit slow lately and I’m trying to tell myself not to freak out yet since it’s most likely because of the heat. 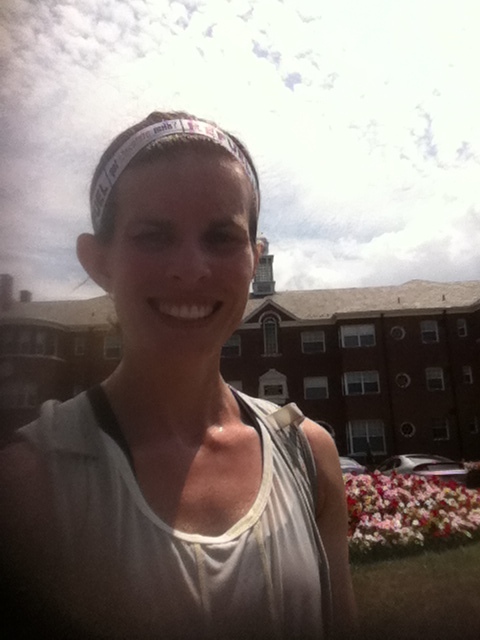 I ran home Tuesday night in 99-degree weather, hit the track Thursday night when it was still 102 with the heat index and then overslept Saturday forcing my long run to be in midday 100+ degree heat again. I really, really hate the cold, so I always try not to complain about the heat, but this heat wave sure is draining. How do you beat the heat and exercise safely in it?? I make sure I’m hydrating all day long – not just right before or during my run. 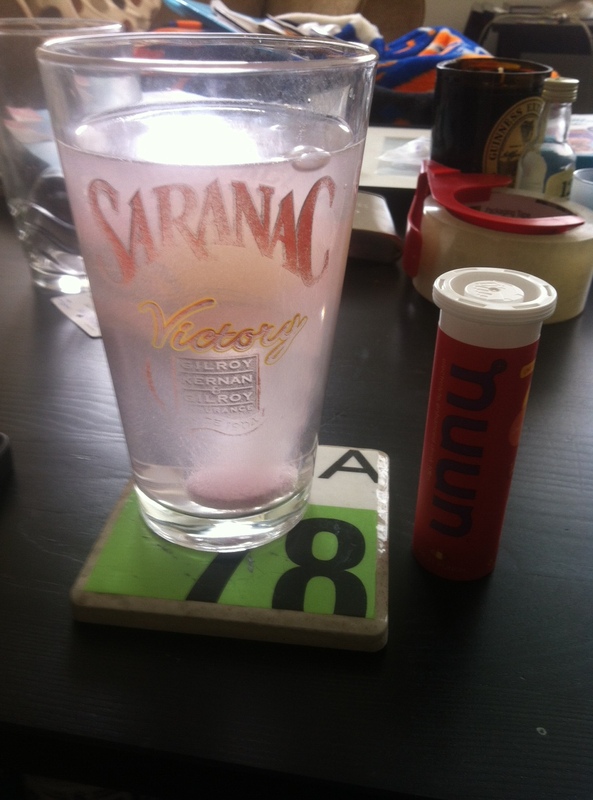 I alternate between plain water and Nuun electrolyte tabs and absolutely love Nuun as a recovery drink during a lazy afternoon on long run days. 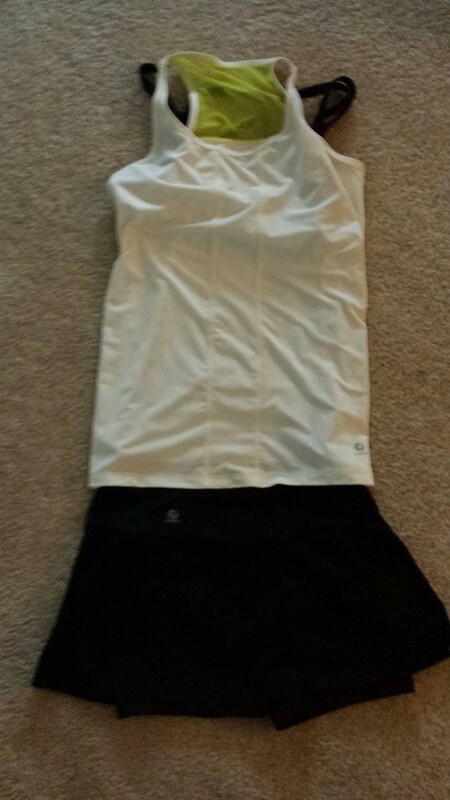 I wear light-weight, light-colored, moisture-wicking clothing as much as possible. 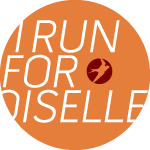 For yesterday’s long run I sported my mio mesh tank from Oiselle, which is perfect for this kind of weather along with the Oiselle strappy sports bra and bum wrap skirt – my all-time favorite running skirt. I also carry hydration for any distance run. I used to HATE carrying water, but years of living in D.C. has taught me that it’s necessary. For short to medium runs I’ve been bringing a handheld bottle I have from Nathan. It fits perfectly in my hand, but I always feel like it throws my running off a little when I carry it. On my 9-mile run home from work Tuesday I stopped by a water fountain to refill my bottle around mile 7.5 before the final all uphill charge home. I didn’t let myself look at my watch along the run since I didn’t want to freak out at the slow pace and push too hard in the heat, but I thought I was doing pretty well. A very pregnant lady carrying another small child was walking up to the water fountain at the same time as me so I stopped to let her go first. She took one look and said, “you look like you need this a lot more than me!” It was much appreciated, but a bit of an ego bruiser! For long runs I go with my Nathan hydration vest. This is my favorite water pack and I find it way more comfortable than a fuel belt. It’s incredibly light for the amount of water it can hold and I’ve even worn it during my last couple marathons. It usually lasts me the entire 26.2, but this weekend’s long run was a different story. I actually had to refill it not once, but twice! I also splashed water on my head, neck and face during these pit stops. I might’ve looked a bit strange to onlookers passing by, but hey, whatever it takes! What are your tricks? Do you keep running in the heat or take it to the treadmill? Seriously, how is it July already? Seeing as we’re now more than halfway through the year, it’s time to take a hard look at how I’m doing on my New Year’s Resolutions. I’m still staying healthy and that’s awesome. With four trips last month and more to come, one thing that has really helped is having a portable roller known as The Stick. Ian got it for me as a gift and it helps keep my muscles in good shape even when I’m on the road. 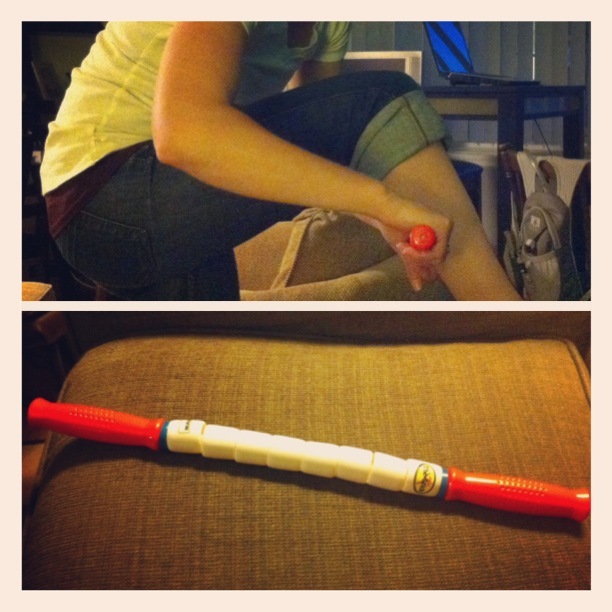 It’s nice to get back from a trip and not have the first time back with the foam roller be super painful. You know that involuntary tears kind of painful…never good, so I’m glad to be avoiding it now! A stronger core was another one of my New Year’s resolutions that will also help keep me healthy and injury free. It was also my focus for the month of June. I actually let these slip a little with all the craziness of traveling, moving and wrapping up my job before I start a new one next week. I actually had to go back and look at last month’s post to remember what I’d put. I still do a good job of getting planks in most days, but I’m definitely not doing enough and need to get back to my full P90X Ab Ripper routine. I had good weeks and bad weeks with drinking soda last month. I just stocked up on Tri-Berry Nuun though, so I’m going to turn to that this month when I’m looking for a drink with some flavor rather than gulping down a soda! My final goal/resolution is my Boston Qualifier. I’m still working hard to get in shape for this and even managed to get long runs in on two of my recent trips to Portland and Montreal so I can keep on pace for this! It’s hard to believe it’s officially fall marathon training season and it’s getting closer to making this really happen. 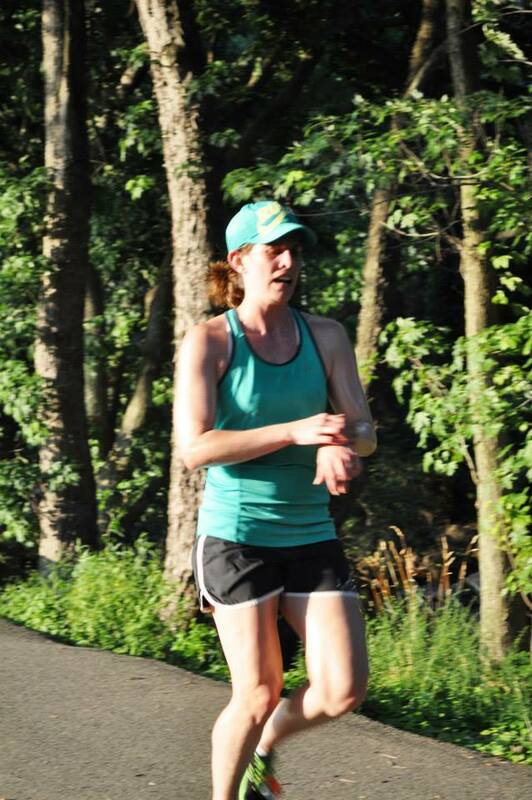 I’m still working on my speed as well as my endurance too and have two speedy races coming up this month including a 4-miler and my first-ever track race for a one-miler. I’m looking forward to a good month and am making cross training my big focus for this month. I only do it two days a week, but I’m going to make sure I get quality cross and strength training workouts in all month. So how are you doing on those resolutions this year? Have you checked any off the list yet? 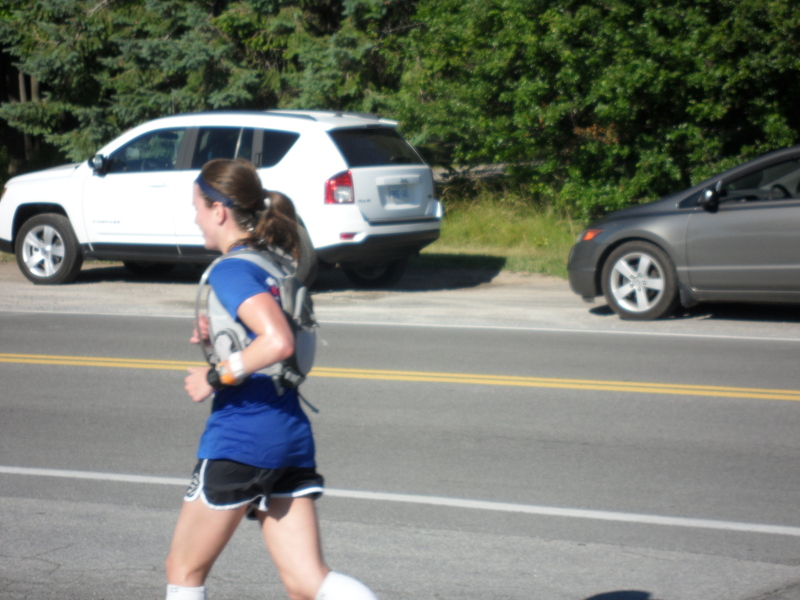 Tuesday night I ran the 2013 Women’s Distance Festival 5k. 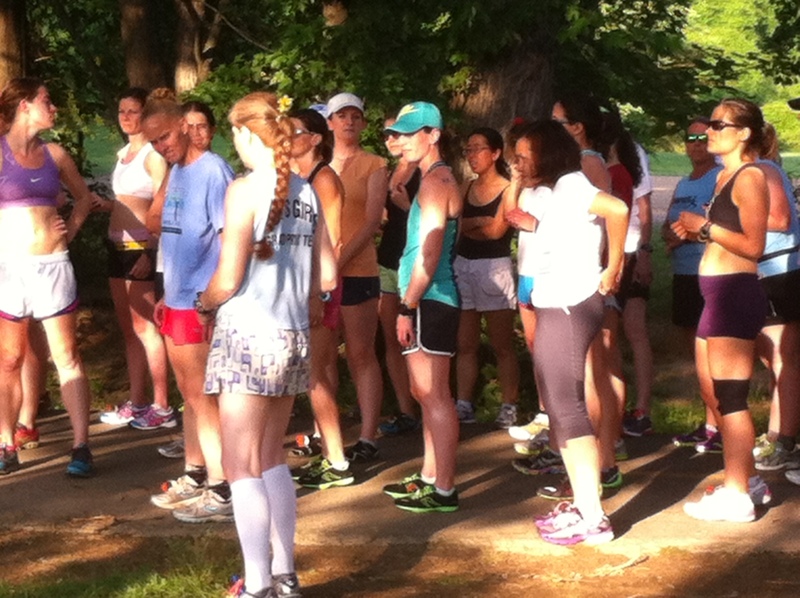 It was one of the DC Road Runners 2013 Bunion Derby series. It was actually one of two races that night. The race I did was a field of all women and we were followed 15 minutes later by a field of all men running the Run After the Women 5k. The race took place in Bluemont Park starting near the South Pavilion. The out and back course seemed tailor-made for a PR and a negative split with what felt like a few gentle hills on the way out and slight downhills coming back. Unfortunately, the title of this blog does not describe my pace for the day. Instead it was smoking hot out – well above 90 degrees still at the 7 p.m. start time. I love warmer weather and will take it over the cold any day, so I hate admitting that the heat slows me down, but this definitely felt like the case Tuesday night. I was drinking water and fruit punch Nuun electrolyte tabs all day so I was really well hydrated or it could have been a lot worse. Still I had an A goal of breaking my 21:25 PR and a B goal of breaking at least 22 minutes, but ended up crossing the line in 23:03. I realized just before the start that I’d forgotten my inhaler and immediately got upset with myself over that. I need to up my mental game when it comes to those kind of things (i.e. my Garmin dying before the start of the Nike Women’s Half), so I don’t let them effect my race. We started off on a shaded path through the park and turned onto the W&OD trail where the sun was beating down into my eyes until the turnaround. I wish I’d worn sunglasses in addition to my running cap, but that was at least somewhat helpful. My legs felt strong, but my breathing was definitely harder than it should be for the pace I was running. I think it was part still getting my fitness level to where I want it to be, but also a bit due to the heat as well. I finished mile 1 in a (slow for a 5k) 7:15 pace, which wasn’t too bad, but then slowed down drastically on mile 2 – 7:48 – before picking it back up a little for a 7:25 third mile. Despite the heat it was a really fun race. It looks like another one in their Bunion Derby series is on the same course in couple weeks, so I might give it another shot! 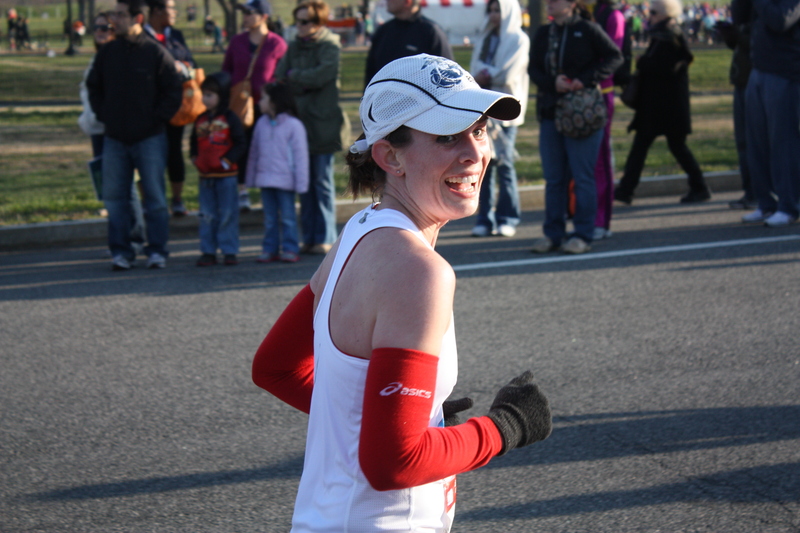 I love the smaller races – and being a DC Road Runners club member, this was completely free for me. Can’t beat that! My usual 5k support crew of 1 (Ian) doubled for this race as a college buddy of his was in town and agreed to come along, so it was fun to have them cheering for me as I ran to the finish line. Another positive takeaway was my new shoes felt great. I picked the Newton MV2s up last Friday and other than a slower run over the weekend this was my first big test run with the super light, zero heel-to-toe drop shoes. I really liked how they felt and will keep using them for my shorter races and speed workouts! Also, despite coming in slower than I hoped, I still finished 13th out of 87 women and 6th in my age group! All in all, this was a great way to spend a Tuesday night…especially since it was followed up with a trip to Ray’s Hellburger!